Speaking of being googly-eyed, the Google may about to shake up your life -- at least if you're an early adopter. See "Google Gets in Your Face" for a preview of the Google Glass project, primed for release soon (for a hefty per-unit price!) to software developers. What will Glass do? Here's breaking news on that topic: "Google shows off Glass apps: New York Times, Gmail, Path and more." Assuming you're not on Google's short list ... before you feel too left out, consider this expert opinion from researcher Steve Mann: "My 'Augmediated' Life: What I’ve learned from 35 years of wearing computerized eyewear." Not the least of what he learned are ways in which augmented-vision eyewear, done badly, can be disorienting. And several ways in which such eyewear can far exceed what Google Glass looks set to offer. But spring, the season of new beginnings, is almost upon us. Be of good cheer! And who won't be cheered to know about "Seven bogus grammar 'errors' you don't need to worry about." Like the one about never ending a sentence with a preposition. As Winston Churchill once remarked, following that "rule" with tongue planted firmly in cheek, "This is the type of arrant pedantry up with which I will not put." 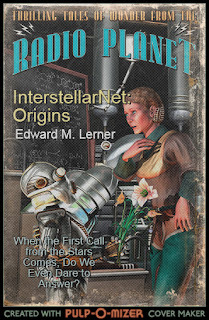 For a bit of play (or more than a bit if you're not careful), consider the roll-your-own, pulp-zine-style, book-cover-building website, Pulp-o-Mizer. 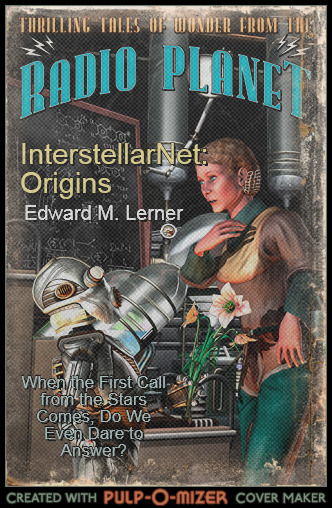 Playing with it myself, here's the new, retro cover I came up with for InterstellarNet: Origins. If you find Pulp-o-Mizer fun -- and seriously, how can you not? -- check out The LoneStarCon 3 Pulp-O-Mizer Competition! The winning entry will be featured in the LoneStarCon 3 Souvenir Book (LoneStarCon 3 being this year's Worldcon, to be held this summer in San Antonio). The winner and runners-up will also be featured in an exhibit at the convention. Finally! The prospect of something good over which (preposition pedantically moved to this sentence's interior) to goggle.